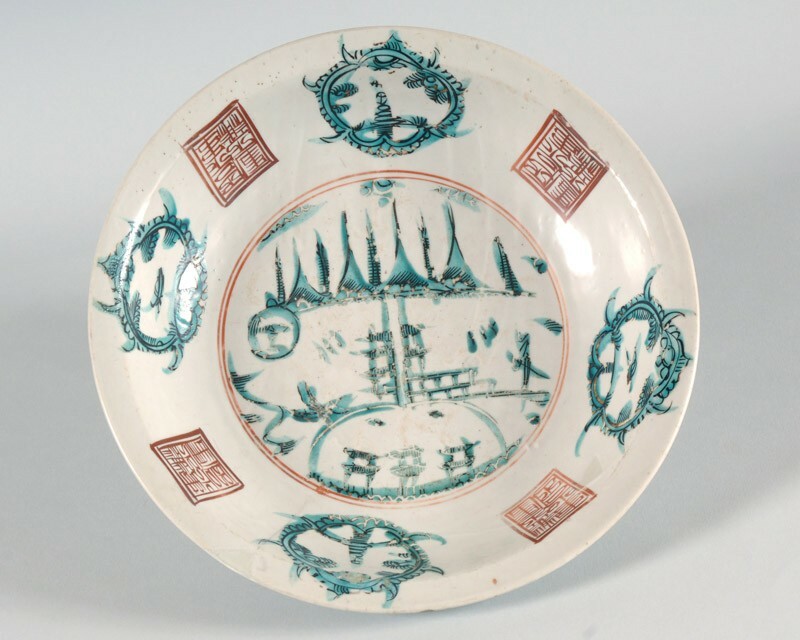 The motif depicted on this dish is known as the ‘split pagoda’, but its meaning has not yet been elucidated. Dishes of this general type are usually called ‘Swatow’ wares after the port city of Shantou in Guangdong province, close to the border with Fujian. Wares of this general type have been discovered at Zhangzhou in Fujian, but no dishes of the ‘split pagoda’ design appear so far to have come to light at that site. The dish has wide rounded sides and an everted rim, and rests on a tapering foot. The inside is painted with a landscape scene in black outlines and turquoise washes, with a steep mountain range under a sun and clouds, with a pagoda, apparently split in two, and a lake in front with three pavilion-like gates, all surrounded by two red lines. The sides show three lobed roundels with further pagodas among rudimentary branches, and four red seals of debased Chinese script, written to be read from the rim. The outside is plain and shows the opaque white glaze which has been applied in several layers, with much grit adhering around the foot.